U.S. and California Economies Post Solid 2016 | CVF Capital Partners, Inc. The S&P 500 was up over 11 percent in 2016, however the year was highlighted by a high degree of uncertainty. The stock market correction in January, the Brexit surprise, and Donald Trump's unexpected victory are just some of the events that have left small businesses feeling increasingly uncertain. The table below highlights the evolution of the U.S. and California economies over the last several years. The U.S. has seen consistently falling unemployment with average GDP growth of 2.0% to 2.2%, but has depended on strong personal consumption and moderate levels of corporate investment to drive the economy due to trade deficits and tepid government spending. California GDP has grown just above the U.S. trend range the last few years, largely driven by technology and the leisure and hospitality sectors not to mention the construction, energy and ag sectors. 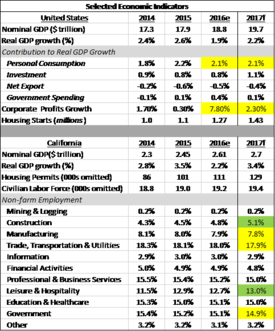 The table also highlights the sectors that remain laggards (in yellow) which include manufacturing, transportation and business services. We remain cautiously optimistic about 2017, although it's far from clear as to how President-elect Donald Trump will impact domestic and global events during his upcoming administration and what Europe's populist push means for the global economy. However, if U.S. GDP growth does indeed expand faster than it has, that's good news for small businesses. If the new president decides to follow through on his hard-line trade agenda, a great deal of further uncertainty will be injected into the business plans of small businesses. CVF anticipates mitigating the impact of these market risks in its portfolio by waiting out the volatility and taking advantage of improved valuations to invest in firms with superior long-term prospects. Due to unstable economic conditions in many areas outside the U.S., a rising dollar, and the fact that U.S. small businesses stand to gain the most from a lower tax rate, small businesses will be a sweet spot for investors in the near term. We hope President-elect Trump's promise of growing the pie rather than just redistributing it becomes a reality, but one should not forget that the President-elect is an "apprentice" president. His first 100 days could see some errors, which could result in a recalibration of expectations. The President-elect’s proposals for corporate tax reform, less regulation, and fiscal stimulus should be broadly beneficial to the economy and corporate earnings. Repatriation of overseas cash has the potential to unlock additional cash that can be directed toward dividend payouts by large public companies providing more investable capital to the broader U.S. economy. The leading causes of risk heading into the new-year are the changes wrought by the recent U.S. presidential election, Brexit, and uncertainty regarding the path of interest-rate hikes by the Federal Reserve. These are several among a collection of factors with the potential to produce short-term volatility and longer-term impacts on sector and company fundamentals. The U.S. remains a tale of two economies – strong consumer spending partly offset by weak industrial activity that may result in modest but accelerating economic growth. Valuations in many areas of American small businesses seem stretched, but it may not remain so expensive if there is a pickup in revenue and EBITDA from potential fiscal stimulus policies.